Everybody knows that plants can die of thirst, but don't forget you can also send them to an early grave by overwatering. When we overwater, the soil becomes saturated and forces out vital oxygen, and we literally drown our plants. So then how do we know when to water our plants? Here are some simple and useful methods that should help. What's the Demo Garden Weather Like? Here is an update; I have included all the data for the winter so far. Overall, it looks like a pretty good rainfall year, and no frost. Remember the Rainfall calendar is July 1 through June 30th, so we do not have complete data as the station was brought online in November. We will continue to download and publish the data quarterly, but feel free to ask for more details. Do you need gardening advice to help you grow a more sustainable garden or landscape? The University of California Master Gardeners are proud to invite you to our newly created Demonstration Garden for our inaugural "Advice to Grow By" program! Monthly workshops will be held every third Saturday, beginning January 16, from 10 am to noon at the Demonstration Garden. 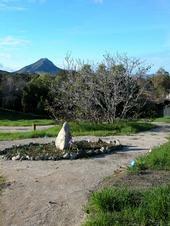 The Garden is located at 2156 Sierra Way in San Luis Obispo, immediately north of the UCCE office, and represents a cooperative project between the County of San Luis Obispo and the University of California. We are so grateful for the hard work that the Youth CCC's put into our garden! They found this large rock under the walnut tree and moved it over to use as a garden feature in the center of our "round about" path.